I actually can't believe that have started a youtube channel, I know it sounds silly but it has boosted my confidence so much since starting it. I thought why not give a little demo to show you this product while I'm at it. Makeup Revolution is a London based makeup company that sell a variety of amazing budget products including eyeshadow palettes, concealer and so much more. The company is cruelty-free and many of the products are gluten free and vegan-friendly. I have never tried liquid highlighters before only ones that are powered pressed into pans so trying this was something totally new for me. I have seen so many high-end liquid highlighters but the price of some of them made me gasp with disbelief so finding a budget-friendly option was very welcome for me. They are 7 different shimmery shades to choose from and boy did I have a hard time which one to choose so I just chose at random and bought 'Unicorn Elixir'. The formula for these is cruelty-free, vegan and gluten-free. So 'Unicorn Elixir' is a magical shimmery and reflective and iridescent lilac. I was super impressed with the formula of this because it's so darn thick and very pigmented. You don't need much product for a gorgeous shimmery glow. You can use this as a highlighter or you could mix it with your foundation for a dewy glow. I would even say you could use it on your body for a sparkly look. As you can see by the swatch below which is only one large drop of the product is that you don't need much to get a gorgeous pigmented shimmer. I suggest putting a small amount of product on the back of your hand ( one or two drops ) and apply the highlighter to places desired with your makeup brushes of choice. I love using Collection contour brush and my Primark buffing brush with this liquid highlighter. How much is the highlighter? Well, I was surprised that it only cost £6 which is a good price for a product that works so well and it so pigmented. It is available on the makeup revolution website here and also in Superdrug stores. 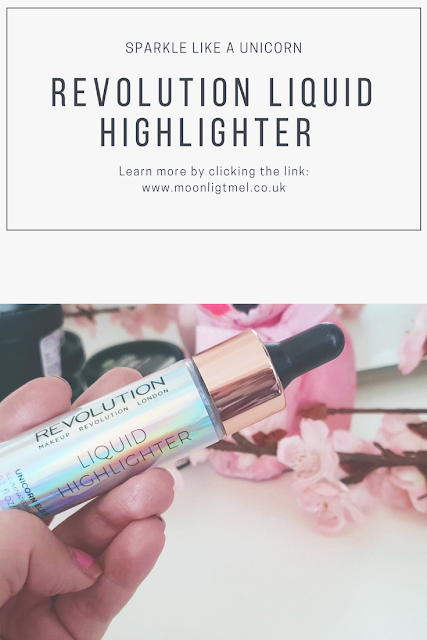 I love this highlighter and I have definitely been won over by using a liquid highlighter. I would even say that this is a multi-use product as you can use it as a highlighter, mix with foundation for a luminous dewy glow or even use on your body for a sparkly shimmer; whats not to love? I like to use this on my cheekbones, cupids bow and to highlight my nose too. I think its a very long lasting product and works really well the urban decay all nighter makeup setting spray for the long-lasting finish; especially if you're going to a party. I can't reiterate enough that a little bit of this product goes a long way, its like magic how well this product works with even a drop, you could even say its magical. It can be a little tricky to use at first but as I said above put it on your hand first and apply with makeup brush of choice to the area desired. Even though I love this product a lot I am not keen on the smell of it but it works so well that I am not bothered by that at all. Have you tried liquid highlighters before; if so what is your favourite? I have yet to try a liquid highlighter but this one looks really nice! I love the shade!